Last Friday, a giant in country music passed away. George Jones was not only considered by many to be the greatest country singer of all time, but also one of the most self-destructive. His string of hits was fueled by a private life of booze that was nothing short of devastating. Once when his wife hid the car keys so he couldn’t go buy alcohol, he hopped on a riding lawn mower and rode it into town to the liquor store. He later parodied the story in a music video. But despite the long chain of events that few mortals could survive, George Jones climbed to the top of the mountain and made a place for himself that will forever be the gold standard in country music. His life was a soap opera that was mirrored in the songs he sang. His struggles with the demons of alcoholism are reflected in some of his album titles: “The Battle”, “Bartender’s Blues”, and the defiant “I Am What I Am”. But out of this self-inflicted carnage of a tragic life, one song emerged as arguably the greatest country song ever written: “He Stopped Loving Her Today”. The song is performed with the singer telling the story of his "friend" who has never given up on his love. He keeps old letters and photos, and hangs on to hope that she would "come back again." The song reaches its peak with the chorus, telling us that he indeed stopped loving her – when he finally died. It’s poignant, sad, and paints a heart-wrenching portrait of absolute love and devotion, as well as never-ending hope. Not only does it drill to the core of emotion, but it delivers the story with the few words. So what does this have to do with writing books? Everything. It’s called the economy of words—telling the most story with the least amount of text. It is an art form that songwriters must master, and novelists must study. There is no better example of the economy of words than in a song like ‘He Stopped Loving Her Today’. Not one word is wasted. No filler. No fluff. Remove or change a word from the song and the mental picture starts to deflate. The story is told in the most simplistic manner and the result is a masterpiece. Every word is chosen for its optimal emotional impact. Nothing is there that shouldn’t be. It is a grand study in how to write anything. 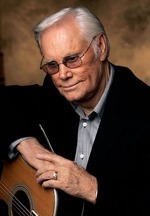 I’m not suggesting that your 100K-word novel be written with the intensity of George Jones’ song. In fact, if it were, it would probably be too overwhelming to comprehend. But my point is that no matter who you are—New York Times bestseller or wannabe author, your book contains too many unnecessary words. If you can say it in 5 instead of 10, do it. Get rid of the filler and fluff. Respect the economy of words. Less is more. For those that love George Jones, enjoy this video. For those that have not heard “He Stopped Loving Her Today”, click the link, listen and learn.